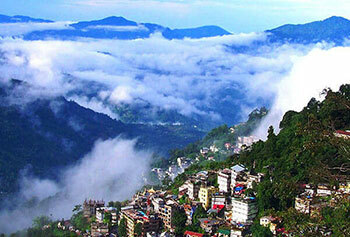 North East India is exotic, fascinating and captivating. If you love amazing natural beauty, simplicity in life, warmth in people and spice in food, visiting North East India is a must for you. Popularly known as The Seven Sisters (Arunachal Pradesh, Assam, Manipur, Meghalaya, Mizoram, Nagaland, and Tripura) and the Himalayan state of Sikkim form North East India and if you wish to enjoy an unexplored and serene holiday, pack your bags soon! Bestowed with mesmerizing natural beauty these states are culturally, linguistically and ethnically diverse, yet they hold some amazing common features, which unify them with a fascinating charm. The zone is a delight for the tourists. Monasteries, wildlife sanctuaries, trekking terrains, religious places, lakes & rivers, gardens & valleys, breathtaking peaks and lush green tea plantations and much more accentuate the beauty of North East India. To name a few, The Tawang Monastery, Sela Pass & Lake and Gorichen peak are the pride of Arunachal Pradesh. Kaziranga National Park known for Indian one horned Rhino, Devi Kamakhya Temple, Brahmaputra River and the lush Tea Gardens make Assam different. A cultural exposition at Manipur is one in itself. Loktak Lake and Sendra Island are very popular here. The wildlife enthusiasts should go sighting Sangai - the rare and endangered Brow-antlered deer. Furthermore, the cult of Radha and Krishna is a visual treat in Manipuri Raas Leela and do not end the tour without enjoying the local rice beer here, if you are in for a drink! Not to miss, Meghalaya’s living root bridges, Nokrek red panda and Nohkalikai falls have attracted visitors from far & wide. 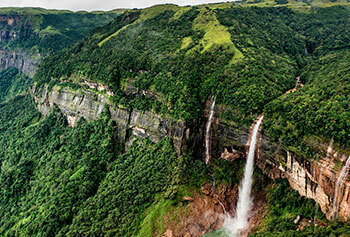 The Rice Bowl (Champai valley) and the beautiful water falls & snow - cladded peaks of Mizoram will surely keep you gazing. When it’s about festivals of North East India, the Hornbill at Nagaland & Bihu of Assam are worth a watch. Tripura’s Neer Mahal & Unakoti hills and the scenic destinations like Yuksom, Tsomgo Lake and Nathula Pass at Sikkim are the most visited destinations. North East is not only about scenic beauty, rather its high elevation, tall mountains and natural marvels make this place an adventurous destinations as well. "One Horn Rhino was my daughter's favorite animal. So, this year we had to take a trip of the North East of India to celebrate her birthday. Coming to the place, we got more than we expected. The people are hospitable, the foods are fantastic and the nature is jaw dropping. I will come here for more." "Safari in the North Eastern India was like a dream come true for me. There is a great diversity of people where colourful cultures welcome you. Furthermore, the Indian green is greener as compared to the World! I loved my experience in India. Thank You Max Holidays! You guys are a saviour really!" "Me and my Officemate are devout buddhists. We had to look for a place where we could find a cultural acceptance as well as a religious affinity. This time, we chose North East India to do our job. It was a great experience with a highly religious resonance. I would love to explore India and its beauty."